I know I don't need a reason to bake but on this occasion I do have one, I have made Vanilla cupcakes with lemon buttercream icing, it was going to be white glace with a fondant design on the top... Then I got distracted on YouTube by a tutorial on two-tone Buttercream and voila! The cupcakes all 30 odd of them are bound for tomorrow afternoons bring and buy sale in aid of the schools sponsor child - Frank from Mozambique. I wish I could send him a cake too but the school is hoping to buy him and his family a goat (for a christmas gift in addition to his sponsorship money)which, has considerably more longevity and use than a cupcake would. Having recently donated lots of old toys and books to the local charity shop I wanted to contribute with something and cakes to sell seemed a good idea. 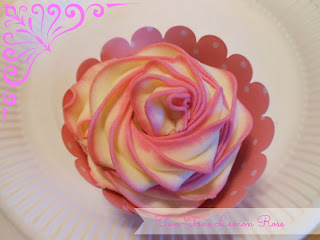 I enjoyed the two tone effect but it took me a little while to get the technique right, I struggled with making the colours stay in the right place in the piping bag without trapping lots of excess air in which makes a mess as you try to pipe a nice consistent rose. I also tried a new ratio of icing sugar to butter for the icing and would probably use it again but sparingly - a great consistency and flavour if on the rich side of things. I prefer cream cheese frostings as they're nowehere near as sweet but I didn't have time to make it fresh on the day and it doesn't keep well in my opinion. There's lots of knitting on the go - a Heliopath vest by Emma Welford on Ravelry here, it's actually quite a bit further on than the image below now. I'm knitting it in Stylecraft Alpaca DK which is a new yarn and working up a treat.